The Elland Feud A feud between: the Plantagenet family of the honour of Pontefract and the Plantagenet-Warrene family of the manor of Wakefield, Conisbrough and Lewes. Key: Red -supporter of King Edward II and III. Green- supporters of Thomas Earl of Lancaster. 1.A feudal state of affairs developed between Thomas Earl of Lancaster ['Plantagenet' ] and John 8th Earl Warrene who held the manor of Wakefield. Lancaster had grown extremely powerful in the Noth when he married Alice de Laci,* the heiress of the honour and castle of Pontefract. This feud began in the year 1317 and continued for five years until the untimely death of Lancaster in 1322. Edward II made Thomas, earl of Lancaster his chief commander during the wars with Scotland. However Edward II became disenfranchised as a result of Thomas' popularity with the people. Thomas argued that the population were being over-taxed and had suffered a number of famines. Edward appeared indifferent to the peoples plight. * Alison Weir gives her birth year as 1281 which would make her about 13 years of age at the time of her marriage contract in 1294. Alice de Laci was abducted at Canford in Dorset by the supporters of John de Warrene and taken to Warrene's main fortress at Reigate in Sussex. This was most probably done with the support and connivance of King Edward II. As a result, Lancaster laid siege to Warrene's northern castles of Sandal Magna and Conisbrough. Thomas was later beheaded in 1322 at Pontefract by the king for his rebellion at Pontefract and Boroughbridge. 3. 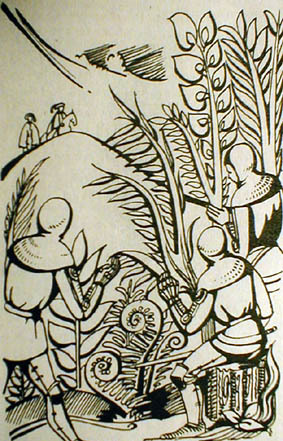 Exley took refuge with Sir Robert Beaumont of Crosland Hall, a kinsman, after which Exley paid compensation to the Eland family in the form of a parcel of land. 4. In 1341 Sir John de Eland with his men travelled to Crosland Hall, on the way killing Hugh Quarmby of Quarmby Hall andLockwood of Lockwood. He lay in ambush and when the drawbridge was lowered to allow a servant girl to return home, he killed Sir Robert Beaumont by beheading him in his own hall. They then sat down in Crosland Hall and ordered a large meal, inviting Adam Beaumont, a son of Robert to join them to which invitation he refused but was forced to watch anyway. 5. Following these events Lady Beaumont [Agnes de Quarmby Robert's second wife], her two sons Adam and John and also the son of Lockwood, Hugh Quarmby's son and Lacy of Cromwell Bottom moved to Burnley, Lancashire for safety. Whilst here the men honed their skills in archery and fencing. 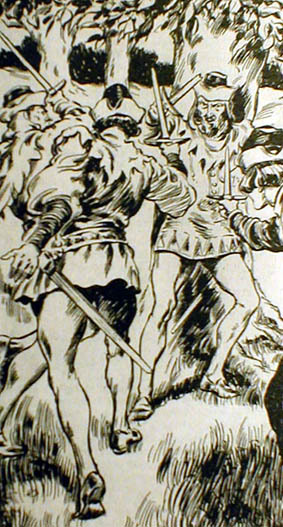 6.In due course  Adam Beaumont and the others returned and killed Sir John de Eland in an ambush at Lane Head, Broadfoot, on his way to the Shire-Reeves Tourn in Brighouse. They then repaired to Furness in Lancashire but returned a year later. Note: Lockwood was originally North Crosland in D.B. 7. At Cromwell Bottom [Bothan] Wood, Adam Beaumont, Hugh Quarmby, John de Lockwood and Thomas de Laci also conspired to kill John de Eland jnr. and his son on their way to church. 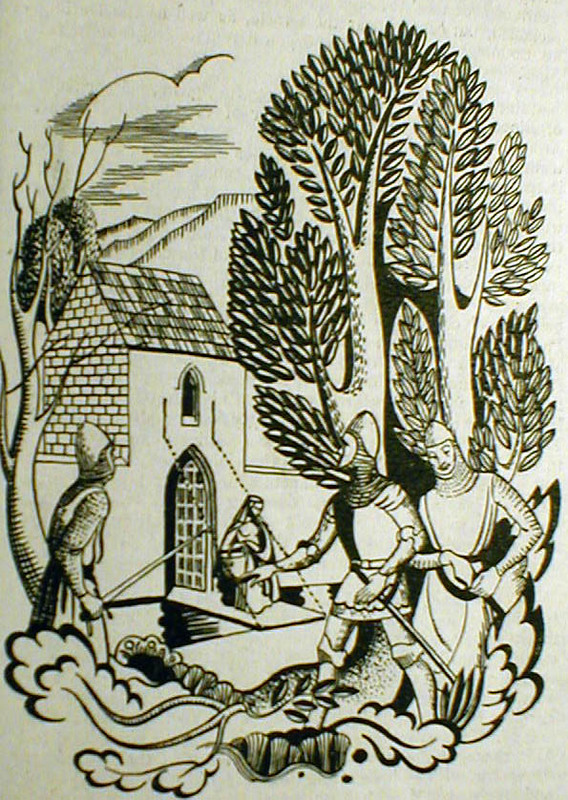 Quarmby and John de Lockwood were chased and slain*, Lockwood having been betrayed by his sweetheart at Cawthorne. She was the daughter of the tenant of Cannon Hall, Cawthorne. The tenant came to hear of Lockwood's involvement and sent word to the owner of Cannon Hall, Thomas de Bosville, who sent men to Cannon Hall who then hanged Lockwood. Adam Beaumont died, later fighting against the Turks in Hungary with the Knights of Rhodes9. The Lacys' (de Lacis') faded temporarily in the north. * Some say John Lockwood was hanged. Margaret, the defendant, had entered as heir of William, who had died s..p.
8. The Elands became extinct, their relatives, the Saviles succeeded to the Elland estates when Sir John Savile married Isobel de Eland. They continued to live at New Hall [rebuilt in 1400's]* The Saviles already owned the manor of Thornhill and estates since Edward III's time, their original seat and estates being at Dodworth, near Barnsley. * New Hall was purchased and restored in 1943 & resold in 1971. 9. John de Falconberg/Fauconberg succeeded John de Eland as Shire-Reeve (Viscount) of Yorkshire in 1342. Supporters of Edward II & III Supporters of Thomas Earl of Lancaster who were after opponents of the De Elands. 4. John de Eland (jnr.) and son. 3. Quarmby of Quarmby Hall and son. 4. Lockwood of Lockwood and son. 5. Lacy of Cromwell Bottom. * Warrene returned to supporting Edward II after the death of Gaveston. Quarmby, anciently the seat of a family of that name. In the reign of King Edward III. 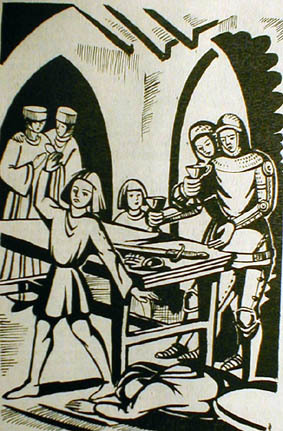 1341, Sir John Eland, being High-Sheriff of Yorkshire, a quarrel took place between him and three neighbouring gentlemen: John de Lockwood, Sir Robert de Beaumont, and Sir Hugh Quarmby; what occasioned the dispute does not appear, but it arose to such a dreadful height, as to cause the death of all the three, who were murdered in one night, by the Sheriff and his men; a circumstance that strongly marks the ferocious manners of the times. --Watson [also in Hunter's South Yorkshire8]. That stirred the strife anew. Of nought they were afraid. *Note: William Dugdale in his Visitation of Yorkshire 1666, p. 253 shows John, Adam and Thomas as the sons of Sir Robert and Gracia although this goes against the usually accepted descendancy from Agnes de Quarmby. Sir Robert [killed 134815] - a main character in the ballad of the Elland Feud. is mentioned as militis in ~ 1317 [10 Ed II] and in1303 became the heir of the manors of Over Whitley, 'Crossland' [today Crosland] and Huddersfield [Burke's Heraldic History of the Commoners.] Abt 1324 in the final years of King Edward II he was appoited Commissioner of Array in the wapentake of Agbrigg and coroner for Yorkshire. [Ibid.] Adam - Dugdale in his visitation of Yorkshire in 1666, p. 253 shows him to be son of Robert and brother of John. In 1350 adam sold lands to Adam de Hopton of Mirfield - the deed was witnessed by Sir John de Eland, Sir Brian de Thornhill et. al. [Sir] John - granted lands in Crosland in 1332 to Adam son of Alexander Radcliffe. Dugdale in his Visitation of Yorkshire in 1666, p. 253 says he was militis and lord of Whitley in 21 Ed III . [Sir] Thomas- Abt 1326 was seised of the manor of 'Brerewysel' gifted by Henry de Chevet. 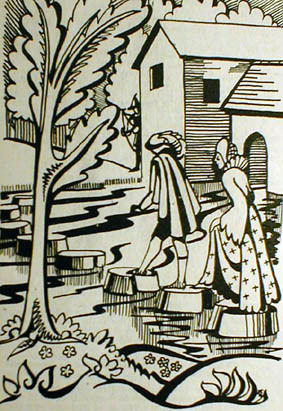 In 1347 Thomas granted an annuity to Alice, wife of Thomas de Bosville of Cawthorne. Joyce Moore is descended from the Elands and the Lacys of Cromwellbottom, Isabel de Lacy and Thomas, her husband, etc. All but one person is her ancestor. Joyce says reading about this, as a descendent, it sounds like a comedy that was written for the stage! Janis Comstock-Jones is tracing the Lockwoods of Lockwood. The name Lockwood does not occur in the Domesday Book which was then called 'Crosland' [North]. 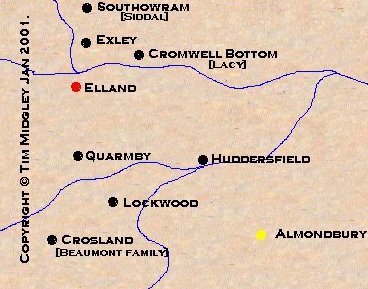 It is speculated that Lockwood gained its name when the family name was applied to the vill to differentiate it from South Crosland. 1. Midgley J.F. Midgleyana. Litho Press, Cape Town, 1968. 2. Pratt C. T. The History of Cawthorne, Barnsley 1881. 3. Hunter, Joseph South Yorkshire : History of the Deanery of Doncaster vol II, 1831. 4. The Yorkshire Dictionary, Thomas Langdale, 1822. 7. Yorkshire Archaeological Journal XI. 8. Hunter, J. South Yorkshire Vol II p. 231. 9. Watson, John. History of Halifax..
10. The Eland Murders, 1350-1. A Study of the Legend of the Eland Feud. Yorks,. Arch. Soc. Journ. Vol 51, pp61-79. 12. Guidebook : Welcome to Cannon Hall Museum, a pamphlet by the Friends of Cannon Hall Museum. 13. Midgley, Samuel. The History of the Town and Parish of Halifax.1789..
14. According to Edward T. Beaumont, The Beaumonts in History A.D. 850 - 1850, ca. 1929. 15. Burke's Heraldic History of the Commoners - Beaumont. 16. Aheir, Philip. The Legends and Traditions of Huddersfield and its District. v. II, Pt. I, The Elland Feud, p. 17, G.N. Allsop. 17. Ibid. Pt. II The Elland Feud pp. 26, 59, G.N. Allsop. 18. Ibid. Pt. 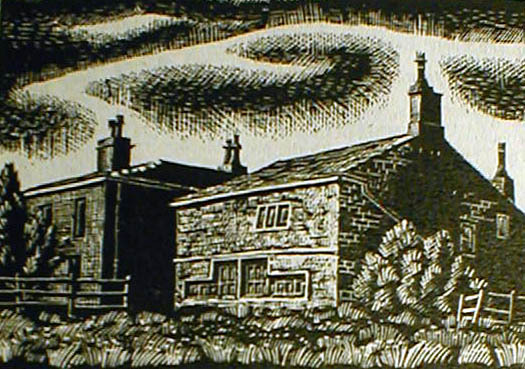 III, Elland Feud, pp. 122, 134, 141, G.N. Allsop. 19. Ahier, Philip. Revenge upon Revenge in The Legends and Traditions of Huddersfield and its District, vol II, pt. I ,The Elland Feud, 1943, p. 18. 20. C. P. R., July 1351 Edward III, vol. 9, p. 156. © Copyright 2000. Tim Midgley 2000, revised 16th February 2019.